Access to even a basic word processing programme can be helpful, and a student with dyslexia will produce better work on a computer than if they were handwriting. The computer will always produce clear legible writing, whereas handwriting may be difficult to read. Spelling can be checked using the spellchecker. Editing and rearranging text is easy, so students do not have to rewrite laboriously to produce a final draft. This facility also helps students who have sequencing difficulties as it is easy to edit the text so as to rearrange the sequence. Forgotten information can simply be added in later, or a paragraph moved to improve the flow of the passage. The AutoCorrect feature in Microsoft Word is a very useful tool that is often underutilised. It can be customised so that the individual can build up their own bank of commonly misspelled words. 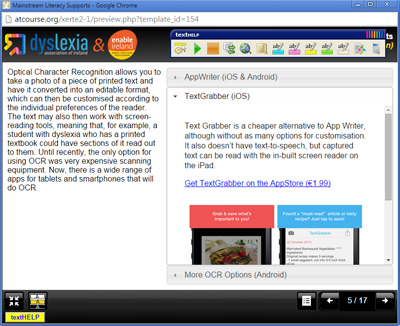 Screen readers are also a very useful tool for supporting writing. They allow the student to hear any errors, e.g. a mis-typed word, or an incomplete sentence. WordTalk is a free text-to-speech plugin for Microsoft Word which also includes a talking spellchecker. Commercial software packages such as Ghotit, Ginger, ClaroRead and TextHELP Read&Write have a range of features such as homophone checkers, word prediction and phonetic spellcheckers. They also have more sensitive punctuation and grammar checks than would be available on MS Word. The Livescribe Echo Smartpen is another useful tool for capturing information quickly. It digitally records handwritten notes while linking them to simultaneous audio recording, great for taking notes in lectures and meetings. Using special dotted (digitized) paper, the Livescribe Echo Smartpen wil remember everything you write and hear. Notability is an audio note-taking app that functions in a very similar way to the Livescribe pen. Voice recognition software, which was originally designed so that astronauts could use computers while tucked up in their space suits, is ideally suited for older students and adults who have to produce extended pieces of written work such as long essays. All instructions can be given verbally; the computer will type as you speak. Dragon Dictate Naturally Speaking is the most commonly used programme of this type. While this type of software has improved greatly over the last decade, it will rarely be 100% accurate. There is an initial training period where the programme learns about the user’s voice, and the accuracy does improve with usage, as each time the programme is used it learns more about the user’s voice, speech patterns and the vocabulary commonly use. A compatible digital voice recorder can be used with Dragon; this means that documents can be created by voice anywhere, and when the digital recorder is synched with the PC, Dragon can then transcribe the document. Most tablets and smartphones now include in-built voice recognition features, which can be used to write emails and text messages and also can be used with word processing apps. There are several very low-cost voice recognition apps on the market, with Voice Dictation (Apple) and Olympus Dictation (Android) being two examples.